Leica IIIf and Strap, a photo by sstorholm on Flickr. I just got my wrist strap that I ordered through Etsy from Simple Machines NYC, and I’ve can honestly say that I was less excited over my new Canon 7D (more on that later) than this strap. First of all, it’s absolutely gorgeous and fits perfectly with the feel of my ancient Leica. The quality is simply top notch, it’s comfortable and sturdy without being too stiff. I can honestly say I can’t find one thing that would make this strap any better than it is. How they can sell it for 23 USD I will never understand. And then there’s the handwritten thank-you note that came attached, that really got me, I mean, not only did I get an extremely nice strap for a steal, they then even took the time to write me a thank-you note. So, here’s me returning the favour David & Mai, thank you for an awesome camera strap! 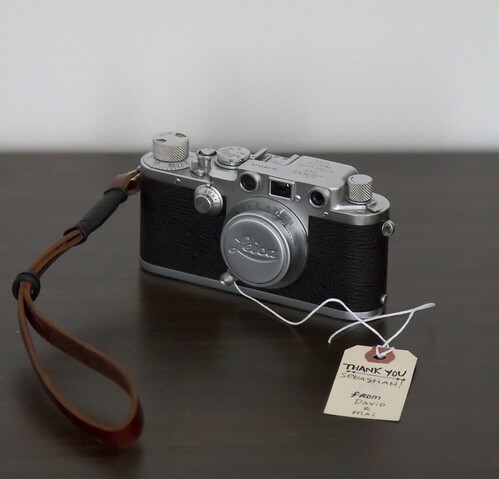 And all you other guys, if you need a good solid strap to go with your range-finder or viewfinder camera, or why not even an SLR, head over to Simple Machine NYC on Etsy and get one of these!